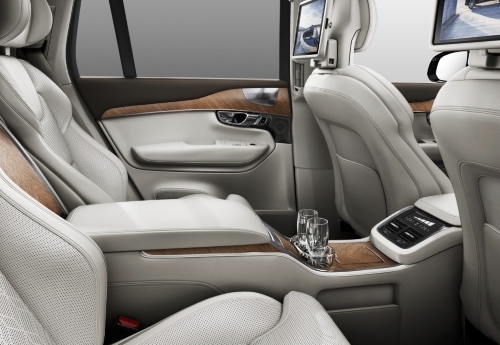 Volvo Cars unveiled the most luxurious vehicle ever built by the Swedish company in its 88 year history at the Shanghai International Automobile Show – an elegant and refined four-seat version of its recently launched XC90. The XC90 Excellence has been crafted by Volvo’s designers and engineers to offer customers a distinct and individual automotive experience that incorporates the latest Scandinavian innovations in design, refinement, comfort and style. The XC90 Excellence is based on Volvo’s all new XC90 sports utility vehicle, but the similarity ends there. The XC90 Excellence has just four seats compared to the original’s seven, creating an enormous amount of additional space for rear seat passengers that helps to deliver an exceptional customer experience. This space is utilised to offer a First Class automotive experience that begins with broad, spacious individual reclining rear seats complete with massage, ventilation and increased leg room, as well as a retractable control touchscreen, folding tables, a refrigerator with bottle and glass holders, a heating/cooling cup holder and handmade crystal glasses from leading Swedish glass design company, Orrefors. 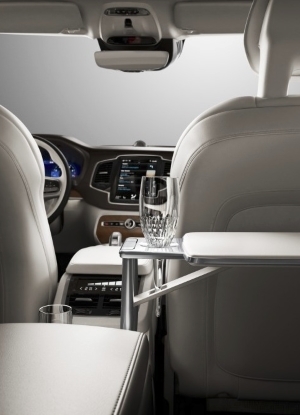 The XC90 Excellence offers its passengers footrests, ambient lighting, illuminated storage and unique leather detailing in blond or charcoal, a luggage compartment dividing screen, additional sound insulation in the cabin and Pirelli Noise Cancelling System tyres (PNCS). 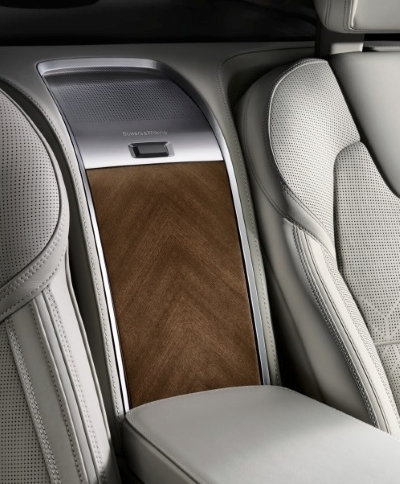 XC90 Excellence passengers will also enjoy a specially-augmented Bowers & Wilkins audio system that adds an extra speaker to its 19 speaker system, resulting in unrivalled high fidelity sound reproduction and surround effect in the rear seats. Reinforcing the Swedish love of fresh air, the XC90 Excellence also comes with an integrated ionic air cleaner in the CleanZone climate system. The ionic air cleaner works by positively charging electrons in airborne particles (dust or smoke for example) so they are removed from suspension in the cabin environment. The XC90 Excellence also offers a leather instrument panel with contrasting thread, while the headliner of the cabin is colour coordinated pure Nubuck textile. Exterior styling differentiators including an Excellence rank mark, chrome B- and C-pillar cappings and lower door mouldings. Volvo’s all new XC90, launched in August 2014, is proving to be extremely popular with customers seeking a luxury SUV. Over 24,000 have been ordered before it has even reached Volvo showrooms. This accounts for approximately half of Volvo’s expected volume for the car in 2015. The XC90 Excellence incorporates all the features that underpin the XC90’s ongoing success, such as world leading safety features, new powertrain technologies and an unrivalled combination of power and fuel efficiency.